Green Tree Python (Morelia viridis) – The young snakes are vivid yellow. As they mature into adulthood they gain their vivid green colouring. In the wild they can be found in the rain forests of New Guinea and the northern tip of Australia. 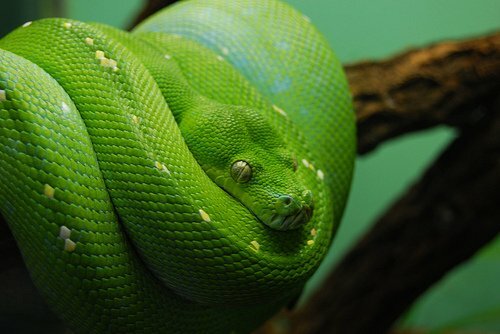 Green tree pythons spend almost all of their lives in the branches and only slide down the trunks to move between trees. Other green snakes of note are the Natal green snake, smooth green snake, Cyclophiops major greater green snake, Green vine snake, emerald tree boa, and the rough green snake. 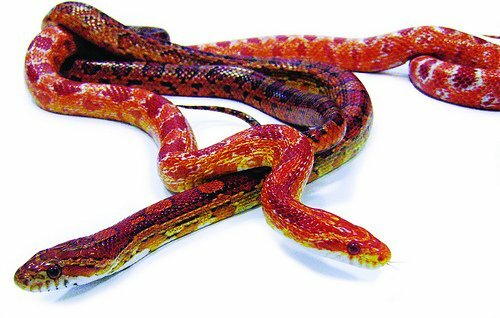 Corn Snakes, a species of rat snake, inhabit North America. They feed on rates and mice, killing their pray by constriction. They live for six to eight years in the wild, but in captivity they can live three times longer than that. They are often kept as pets due to their docile and non-venomous nature. The name corn snake comes from southern farms in the United States where they were found eating rodents that had in turn been eating corn and wheat crops stored in barns. Other red snakes of note are the Milk Snake and King Snake. 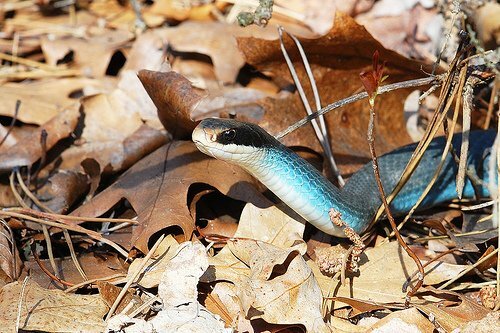 The blue racer snake is a native of a small region of North America (Ontario, Michigan, Ohio, Minnesota, Wisconsin, Illinois) and is know for it’s aggressive behaviour. This behaviour can show it’s self as rattling. The sound is often confused with that of the rattle snake. Other blue snakes of note are the Texas indigo snake, blue green tree snake, Turtle-headed Sea Snake, Blue Coral Snake, Blue-lipped Sea Krait (Laticauda laticaudata), Blue Axanthic plains garter snake, and the Iridescent Shieldtail. 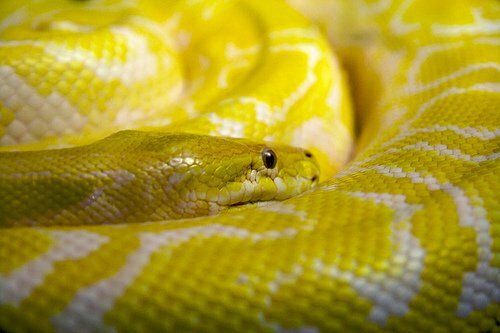 Yellow pythons are actually Burmese pythons in their albino forms. Burmese pythons were originally a species from Southern and Southeast Asia. In recent years they have become an ecological threat to the indigenous wildlife of the Florida everglades after pet snakes have escaped. Other yellow snakes of note are the yellow rat snake, polls yellow snake, mcgregor’s pit viper, yellow bellied sea snake, and the Eyelash Viper (Bothriechis schlegelii). It seems odd that there should be white snakes. White is not generally thought to be threatening, and seemingly does not help with camouflage. There are however white snakes, Albeinos. 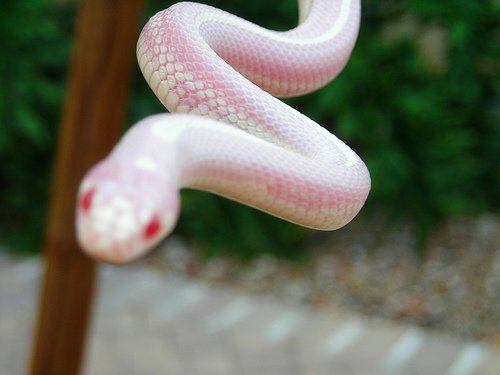 These snakes are not normally white, but a have genetic mutation that causes their lack of colour.